Ultimately there are no guarantees that any party will take care of O’Donnell Park. It is a risk to keep it, a risk to sell it, a risk to buy it. It is risky to depoliticize it, and a risk to keep it politicized. While your questions about the endowment should be answered, I think that ultimately we need to separate the two issues. I certainly hope the parking garage revenue can cover the cost of maintenance and repairs. If it can’t we have yet another example of government irresponsibly spending the taxpayers money. The thing ought to be turning a profit: an actual profit, after cash expenses and depreciation. I’d have preferred to get the county out of the Art Museum entirely by turning over ownership of the land as well. 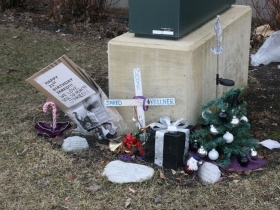 While park land is important, any given parcel should not be seen as sacred. Some can reasonably be sold, other land added, existing parks upgraded. Treating every acre as sacred land which cannot under any circumstances be disposed of has no basis in reasonable stewardship. Imagine treating any piece of property ever bought by one’s self, one’s parents, grandparents, and great-grandparents the same way: no sales under any circumstances. Would that make sense? Is allowing such transfers of ownership risky? Of course it is. Allowing the risks to permanently paralyze the parks is to willfully ignore the equally real risks and costs of doing so. A culture so afraid of taking risks that it ossifies is one doomed. If we would stop thinking of park land as sacred, never to be disposed of, we could sit down and look at risks and benefits rationally. Maybe the transfer in this case would be a bad thing. Maybe not. But until we look at it seriously we shall never know. Refusing to even contemplate change is the biggest risk of all. Did it just reduce the payments from the county from 1 million to $500,000 annually? Because I read that it extended payments to the MAM beyond the end of the current agreement. Thus it’s not a reduction but rather an extension of payments. AG, as I noted, the reduction comes in 8 years. It does extend the current agreement as is, which was for $1.1 million annually for next 8 years, and then extends it after than for 10 more years, but at $500,000 annually. Bruce, you raise important questions. Answers to some O’Donnell issues may be found in an October 2015 county audit (“Continuous Effort Needed to Make O’Donnell Park the Lakefront Destination It Was Envisioned to Be”). Auditor Jerome Heer did a balanced report touching on more than numbers. In some ways he provided more “vision” about O’Donnell’s potential than nearly anyone in County government or elsewhere. His staff studied O’Donnell by the numbers and in person, and researched its counterparts as models. MAM officials said they used the audit to examine all aspects of what they were considering. Having tracked the O’Donnell issue, the risk does not seem excessive for MAM, considering the probable rewards—both tangible from parking and less tangible in the extension of MAM’s campus, access, connectivity and potential programming. Being both a Downtown destination and Lakefront attraction can enhance attendance and other revenue potential. Many great museums have appealing public plazas that serve as gathering places for visitors and passersby. Both Paris and NYC are full of such public spaces. And O’Donnell is an extraordinary “viewing platform” for the entire Lakefront and MAM plans show they plan to enhance that feature. I’ve spoken to parks advocates who had reservations about losing O’Donnell’s considerable parking revenue because it has helped bolster the overall parks budget for years. (Was it $1.2M recently? And it has 200 on a wait list.) But they also noted that money was not being spent on improving O’Donnell and Chris Abele seemed intent on selling it for private development, thus placing the park in jeopardy. So while there may be drawbacks, it will serve the public interest well. Penrod, sometimes conserved land is decommissioned, as is happening with DNR lands that are landlocked or not of high value for habitat etc. Transferring such land to another agency or selling it for an equitable return, after thorough public vetting, seems reasonable. However, after much research I have found less than a handful of instances of actively used parkland, especially named parks, being sold for private development when it did not involve an equitable land swap. Do you know of any examples? Parkland, especially, actively used parks, is sacred for many good reasons going back to the founding of American public parks (in contrast to private parks in England and elsewhere). Before any park legacies are divested, there needs to be stringent analysis of what’s at stake beyond short-term budget fixes. Economists have revealed that many types of privatization offer little real benefit to taxpayers. Cities all over the world are currently investing more in their public realms because of the overall economic gains that produces. At the very least, the Calatrava deserves a wonderful front yard. Virginia, as far as I can tell from the plans for the “park” there is nothing wonderful about the proposed front yard of the Milwaukee Art Museum. Furthermore, it’s hard to fathom how a parking structure is the highest best use of one of the most desirable plots of real estate in the State of Wisconsin. Tom, I agree it’s hard to tell from preliminary sketches how the plazas will be redesigned. Dan Keegan said that will evolve as other Lakefront plans develop. At least now there’s potential for a connected Lakefront and downtown and for it to be publicly accessible and not a gated enclave controlled by a corporate entity. Someday the O’Donnell site will be “re-imagined” and we can only hope there will be such well-used mass transit by then that a parking structure of this size would not be required. However, since the public still owns O’Donnell Park’s land, it will be available for such re-imagining for the highest and best common use. It would not be if it was under private ownership, especially by a for-profit. In the meantime, it’s better to have museum parking west of Lincoln Memorial than building a structure east of it that would eat up even more of the precious scenery. 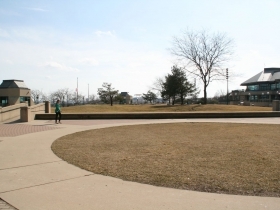 A public space to enjoy views of both downtown and the lakefront seems an appropriate use of this scenic overlook. I hope creative landscape designers will make that even better. One possible explanation for the seeming discrepancy between the $38 Million and $65Million (or $66 Million) figures for current or recent value of MAM’s endowment is that Mr. Murphy is citing both book value and market value figures, which are two different entities. Book value is the aggregate value of additions to the endowment at the time they went on the books—thus “book value.” Market value, is the current appreciated—or depreciated—aggregate market value of the invested funds that make up the endowment. Book value can only change when gifts are made to the endowment fund or when the corpus of the endowment is invaded for current use, something which does not—and should not—often happen. Market value fluctuates from quarter to quarter (and in most cases from day to day), and, in good financial times and with competent financial managers, market value of an endowment will rise; in recessions and depressions, even with good fund management, an endowment’s market value is likely to shrink. If we look at the time frame given, seven years, the beginning of the period would be around December 31, 2008 (large endowments are normally valued quarterly). This was soon after the collapse of Lehman Brothers and the tanking of the larger economy. Even if no gifts arrived or rollovers of investment income occurred over the seven-year period, the market value of the endowment would most likely have increased by 12/31/15. If we look at the 12/31/08 figures given, $27 Million and $28 Million and see them as, respectively, book and market value at that time, it would appear that book and market value back then would be quite close to each other (at some other institutions market value was less than book value). 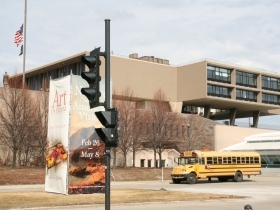 If we take the two current or recent valuation figures given by the museum, $38 Million and $66 Million, as book and market value, respectively, then the endowment would have received $11Million in additional gifts and/or income rollovers over the period and gained $37 Million in market value over the 7-year period. Given the increase in the securities indexes (DJIA, S & P 500, and NASDAQ) since 12/31/08, and competent funds management, the current discrepancy between the two figures given would seem to be understandable. That having been said, I would have to agree that an endowment of this size does not make MAM “awash in money.” Under normal circumstances, institutions use income from pooled endowments, not principal, to support current operations. There are instances in which portions of a pooled endowment may be “temporarily endowed,” that is to say, having the corpus of the fund portion invested, with the principal being invaded to defray certain restricted current expenses. Since this reduces book market value, and income of the total well-managed institutions that are intended to exist over the long term will not use temporarily endowed funds to any significant extent, absent a credible assurance that new gifts will offset the shrinkage in endowment. In any case, annual income distribution from a well-managed endowment with a $66 Million average market value for fiscal year 2016 would probably be between $1 Million and $2 Million. While this is a nice piece of change, it represents a very small fraction of total operating expenses for a museum of MAM’s size and character, with or without O’Donnell Park. Since I have no idea of what MAM’s full budgetary situation is, I have no idea whether acquisition of O’Donnell Park is a good idea or not. It may be that MAM can assemble enough restricted gifts to cover some or all of the purchase—this being an asset that would increase the museum’s visitor count. In that case, parking fee income might help in restoring and maintaining the park and parking garage. The current size of MAM’s endowment, however, is not a major factor in making that decision. Peter, I’m using comparable numbers from the art museum’s annual audits, not mixing different numbers. And yes, there was doubtless considerable growth in value of endowment over that period that came from stock market growth rather than additional donations to endowment. I’d like to compliment everyone for a very adult, issue oriented discussion on the O’Donnell sale. I’d like to make a point that I have not see any of the columns or commentators touch on: First, the payments to MAM over the next 10 years, would have been made with or without the sale of O’Donnell, the County continues to support the Cultural Institutions in our county but by no means pays enough to support their operations. More importantly, the county has not been able to retain the parking revenues at O’Donnell for deferred maintenance and depreciation which would be good budgeting practices. MAM will do just that. One need only to look at the University of Wisconsin System to understand what the State does when business-like decisions to retain funds for deferred maintenance or fiduciary liabilities are held to understand that such practices are punished through reduced shared revenues or even having the state reach-in and take the money since counties are an arm of the state. This practice was experienced in Milwaukee County in their Family Care Program when the stated deemed an escrow which was being held to ensure that Family Care would not become an entitlement program supported by property taxes. The State reached in a took some of the Contingency. When OD Park was first proposed, many questioned the wisdom of putting a parking lot on the best piece of real estate downtown. It’s still a good question. Why is this treated with the reference real parks deserve? This is MacArthur Square Jr. with a better view, a parking lot with a planter for a roof. The county could solve some of its fiscal ills by keeping the land and developing it. As for the value of the Museum’s endowment, the most likely reason for the discrepancy between what they say and what their books show is the simplest: Fundraiser exaggeration. We’ve seen fundraising officials at the Symphony, the Y and the Public Museum in fiscal denial before and the consequences can be painful. Bruce is absolutely right to question the Museum’s assertion that it is in the pink of health when the evidence shows a troubling pallor.. There has not been enough focus on the cost to replace the facility. Garages wear out quickly in our climate and this one has not been well maintained. It is already 24 years old. According to a Journal article dated 1992, the facility cost is in the neighborhood of $35 million at that time. According to RS Means (construction cost index), this would be over $70 million today, and increasing every year. The much coveted revenue stream is not sufficient to justify reconstruction and will expire when the garage can no longer be operated. Who will come up with the money to rebuild? 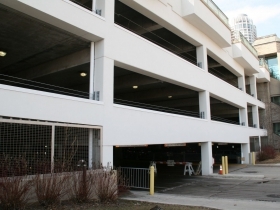 David, the “useful life” of parking structures in Milwaukee is running up to 60 years. O’Donnell serves 60 percent of MAM’s parking needs. 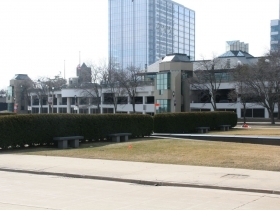 Without stable parking, MAM would have to build a new parking ramp soon–along the lakefront. Fran, the oft-repeated assertion that O’Donnell Park is not a “real park” ignores many “real” urban parks in cities nationwide. Millennium Park, a hugely successful urban park and big boon for Chicago’s downtown, is also a “rootop” park above a parking structure. So are the greatly popular Post Office Square in Boston and Union Square in San Francisco built in the 1940s, and many others. As long as people use cars to get to lakefront attractions and downtown businesses, Milwaukee will need parking to house them. Combining parks and parking is actually efficient. Lack of programming and maintenance are more culprits in O’Donnell’s saga. It’s also goes against research about the value and impact of parks that it’s fiscally wiser to sell off prime public land for yet-another high-rise development (especially for a fraction of its worth and public investment). Short-term budget fixes evaporate quickly. While Milwaukee has an attractive lakefront (one not easily accessed on foot) Downtown lacks compelling public spaces (although some host popular events). Cities everywhere have set aside some of their most valuable downtown land as parks to be enjoyed by all. As more people are returning to urban centers, most major cities are now re-investing big-time in public spaces—and touting the economic returns of those investments. Milwaukee County’s auditor Jerome Heer made that point in his recent audit of O’Donnell Park. Unfortunately, decades of parks defunding and resultant challenges have led many in Milwaukee to throw in the towel and suggest selling off parkland or abandoning park facilities. That can’t-do attitude is also informing calls to consider tearing down the iconic Domes and perhaps replace them with something like a low-maintenance amphitheater. We need to marshal more can-do spirit and creative thinking about our public realm–which is as important to successful cities as the private realm. Comparing OD Park to Millenium Park to justify its land use ignores some obvious differences. Millenium is 25 acres and abuts Grant Park. OD is barely more than an acre. As much as I like The Calling, which is sort of a part of OD, I it simply doesn’t compare to the cluster of works that draw 5 million people yearly to Millenium. Nearly all the people who visit OD come there to park. That makes it a parking lot, not a park. And there are many better options for that site. 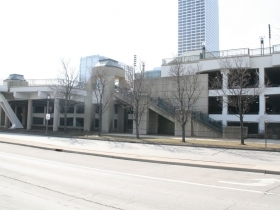 As a “concrete” example, the US Bank parking garage, recently demolished, was 36 years old. While other may last longer, it is often by virtue of expensive reconstruction. This is just one example, but would leave only 14 years left for O’Donnell. My point is not that the parking or the park should be eliminated, only that whoever owns it must also plan to rebuild it, if that is the expectation. Otherwise, the burden is likely to fall back on the public. Relative to a simple parking structure, this facility would be expensive to rebuild given it has only two levels, for the most part, a park on top, and also the pavilion. Net of periodic repairs, there is probably no net revenue right now. David, good point about planning. Splitting the difference, let’s assume the parking structure might warrant rebuilding in 25 years (for whatever reasons). Museum leaders should indeed start thinking about what that might entail and how to fund it. As you note, parking income is expected to fund routine repairs and desired upgrades but not a complete re-imagining/rebuild. There could even be less need for parking by then. Fran, while parkers, including 60 percent of MAM visitors, account for some O’Donnell usage, Flickr photo research shows O’Donnell is also the #1 downtown destination for tourists on foot. It’s also a popular lunch spot. I referred to Millennium ONLY as a type of plaza design: a park above with parking below. Millenium’s design and ambition, including free public programming 365 days a year, is not comparable. However, including parking helped make Millennium possible. The park’s success is a model for how high-quality public spaces can yield huge economic impacts surrounding them. O’Donnell site is 7.2 acres, according to the county’s website. “The Calling” is owned by MAM and part of O’Donnell. It was designed for the site, though originally placed further east. What might be “better options for that site”? Public or private? O’Donnell has been a public park since 1868. The northern half was part of what became Juneau Park. The south section was the quasi-public train depot. By the way, Olmsted always sought to “preserve scenery” and set aside “scenic overlooks” (concepts he popularized) for public enjoyment. He spent 30 years fighting to get Niagara Falls to remove ragtag development around the falls, which was destroying the scenery and visitor experience. That ultimately paid off big-time economically. Olmsted valued “prospects” like O’Donnell’s promontory so much that he created them in landscapes if they did not exist naturally. I agree O’Donnell is not Millenium Park in Chicago, but then Millenium Park is not O’Donnell; A well-known photographer (I can’t ID him since I did not get permission, but I will paraphrase when he said to me) estimated that O’Donnell is the most popular site for photography in the State of Wisconsin. One need only go to this plaza at 10:00 a.m. to watch sometimes as many as 100 folks watching and photographing the opening of the Calatrava Wings. Dawn,sunsets, lake vista, etc. With the Couture development, featuring the transit link with the city Streetcar, the parking garage will be the place one drops off their car to enjoy the entire lake front, the museums, the Festivals, and catch transit to go into a growing urban area. The fact that MAM will be able to both capture and preserve this revenue for benefit of the site is something county government would not be able to do as argued above. With some preservation now, the parking garage has substantial life left and when time for replacement is upon up, MAM will be better able to address the preservation of the museum campus and public plaza than the over-burdened governmental entity. MAM has an excellent track-record doing exciting venues. Last entry on this: the only question before the community is what goes on top of the OD parking lot. Right now nothing is on top of it other than Betty Brinn and Coast. We can do a lot more with the space–and still preserve the photo overlook at the foot of the Reiman bridge that makes this the “most photographed spot in Wisconsin.” (People don’t go to OD to take its picture. They’re there to take pictures of the Museum and The Calling.) What’s the best use? Let’s find out and ask for proposals. While O’Donnell’s plazas could use better basic maintenance, maybe some flowers, and an updated design, they function just as other urban plazas do, whether people move through them or stop for respite. People still intentionally visit the space for varied reasons, despite the lack of any public programming for at least a decade. The site is a popular for weddings and special events and people eating lunch. People walk, run and skateboard there and hang out before and after visiting museums and other attractions. I see few people in any Downtown MKE park at any given time when there is not a scheduled event (and I’m glad there are such concerts and markets). The community will be served by such programming at O’Donnell. In any case, a public space located between an art museum and children’s museum, and one with the best promontory to view the entire lakefront, city–not just the Calatrava–is not “nothing.” We all benefit from this commons set aside by our ancestors. We can certainly make more of this shared legacy and MAM has committed to doing so.